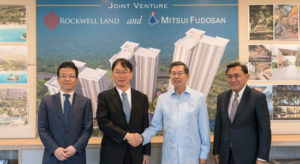 MANILA — Japanese property giant Mitsui Fudosan and Rockwell Land, a local mid-size real estate developer, are partnering on a condominium project in the Philippines. 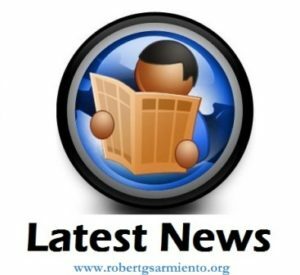 Mitsui Fudosan, which is entering the Philippine real estate sector for the first time, will be involved in the development of three residential towers as part of Rockwell’s The Arton project in northeastern Metro Manila. The partnership will give Mitsui Fudosan a 20% equity stake in the 9 billion pesos ($177.5 million) mixed-use project, according to a statement announcing the signing of a joint venture over the weekend. The Arton is on a 1.9 hectare site. The three towers, which range from 24 to 34 floors, will have a total of 1,700 residential units. The first tower will be launched later in July. Japanese real estate companies are looking for opportunities abroad, particularly in Southeast Asia, where economic growth is faster. Mitsui Fudosan has projects in Malaysia, Singapore, Thailand and Indonesia, as well as in other markets such as China, the U.S. and U.K. The Rockwell-Mitsui Fudosan partnership is the second link-up by Japanese and Filipino developers within a week. On July 10, Federal Land, the real estate unit of conglomerate GT Capital Holdings unveiled a $400 million commercial and residential project in Metro Manila with Nomura Real Estate Development and Isetan Mitsukoshi Holdings. The moves capitalize on Filipinos’ fondness for almost anything Japanese. 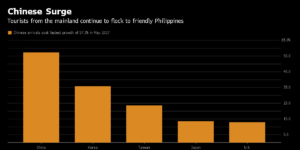 The Philippines is one of the fastest-growing tourist source markets for Japan because of rising disposable income. Last year, Filipinos visiting Japan rose by nearly 30% to around 350,000, according the Japan National Tourism Organization. The Japanese companies are entering the Philippines at a time when condominium prices in Metro Manila are barely growing. In the first quarter, prices rose only 0.8% from a year ago, according to the Philippine central bank. However, Rockwell, which is chaired and controlled by the family of Manuel Lopez, former Philippine ambassador to Japan, was optimistic about the venture. The Chinese traveler is discovering the Philippines as relations warm under President Rodrigo Duterte’s so-called pivot to the mainland. The Chinese posted the fastest growth of 57.3 percent among the top five markets in May with 73,649 arrivals, according to tourism agency data. They’re going not just for the Southeast Asian nation’s famed white-sand beaches, but also for its casinos as an anti-corruption drive in Macau sends gamblers to Manila. Apparently, President Duterte’s harsh domestic policies and foreign policy flip-flops haven’t undermined Philippines economic growth, at least not yet. But they have touched the country’s equity markets, which have underperformed the markets of the region. 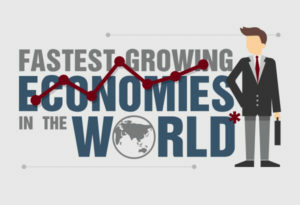 Meanwhile, Duterte’s Philippines is getting corrupt and less competitive, according to Transparency International and the Global Competitiveness reports, raising serious doubts as to whether the current robust economic growth rates will be sustained in the future. Those who have followed the Philippines economy for a long time have seen a familiar show: hard working Filipinos remain poor, watching the people of other nations in the region get rich. Revolutions come and go in Philippines, but the old villains — corruption and political oppression — remain intact, holding Filipinos back from making the transition from poverty to riches. 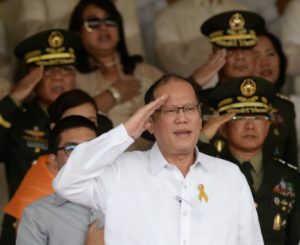 Former Philippine president Benigno Aquino is to be charged over a botched anti-terror raid that left 44 elite policemen dead in 2015, a special government prosecutor said Friday. Aquino, who ended his six-year term last year, was indicted for usurping authority and allowing a suspended police chief, Alan Purisima, to run the fatal January 2015 commando raid, the government Ombudsman said. “Purisima would not have been placed in such a position… were it not for the complicity and influence of President Aquino,” Ombudsman Conchita Morales said in a statement. Supporters of Aquino’s successor, President Rodrigo Duterte, had also filed a complaint of “reckless imprudence resulting in multiple homicide,” against Aquino but Morales dismissed this. Aquino, who could face several years in prison if convicted, is studying the Ombudsman’s order so as to file a motion for reconsideration, a statement from his aide said. “An initial reading shows that there may have been a misappreciation of some facts surrounding the incident, leading to some erroneous conclusions,” the Aquino statement added. The police commandos were dispatched on an anti-terror mission to the rural, southern town of Mamasapano and killed Malaysian suspect Zulkifli Abdhir, who was on the US government’s most wanted list. The policemen were later ambushed by Muslim militants and other gunmen, leaving 44 officers dead in an incident that shook the nation. As a result of the carnage, the Philippine Congress refused to pass a Muslim self-rule bill that would have crowned Aquino’s efforts to bring lasting peace to the rebellion-torn Mindanao region, home to the Catholic nation’s large Islamic minority. Morales alleged Aquino had violated the law by assigning leadership of the mission to an official who was serving out a suspension at the time over allegations of corruption. The bloodbath, infamously known as the “Mamasapano Massacre”, helped to turn public opinion against Aquino, who later unsuccessfully campaigned to prevent the election of Duterte as his successor. Duterte has frequently raised the Mamasapano incident as proof of Aquino’s alleged misdeeds. Reacting to the Ombudsman’s announcement, Duterte’s spokesman Ernesto Abella said that he hailed the “heroic sacrifice” of the slain police commandos. “It is his – and the nation’s – hope to finally bring justice to the victims and families of the Fallen 44 and put closure to the issue as part of the healing process,” Abella added of the current president.